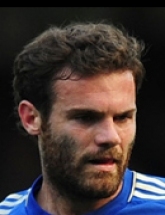 Mata could leave United this summer during the transfer window if he doesn't agree a new deal. Manchester United face Barcelona in the Champions League quarter-final second leg at the Camp Nou on Tuesday night with a one-goal deficit. The father of Manchester United midfielder Juan Mata, Juan Mata Senior, reportedly meets with Barcelona to discuss a potential move. Juan Mata's father claims that the Manchester United attacker has not yet decided whether he will be signing a new contract at Old Trafford. Juan Mata's contract is up at Man Utd in the summer and his father has been discussing potential options for him in the future. Juan Mata and Ander Herrera have 85 days left on their Man Utd contracts and Ed Woodward is causing himself more problems if he lets them go.